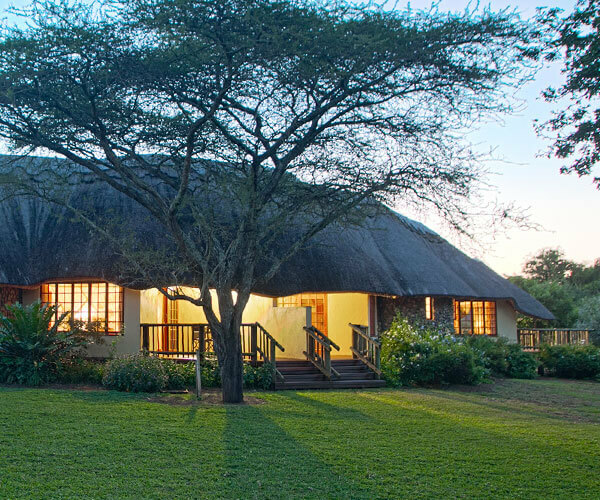 The lodge grounds sprawl through an area of thick riverine vegetation, rich with bird and animal life, and filled with magnificent fig and fever trees. The grounds also include a reception with curio shop, dining room with bar, WIFI, lounge, and swimming pool. 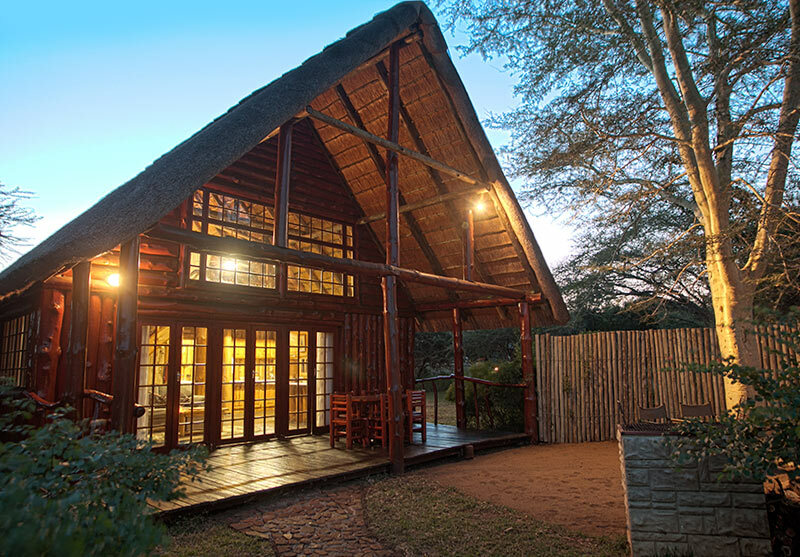 Rhino River Lodge offers three types of accommodation to suit our guests’ various needs. 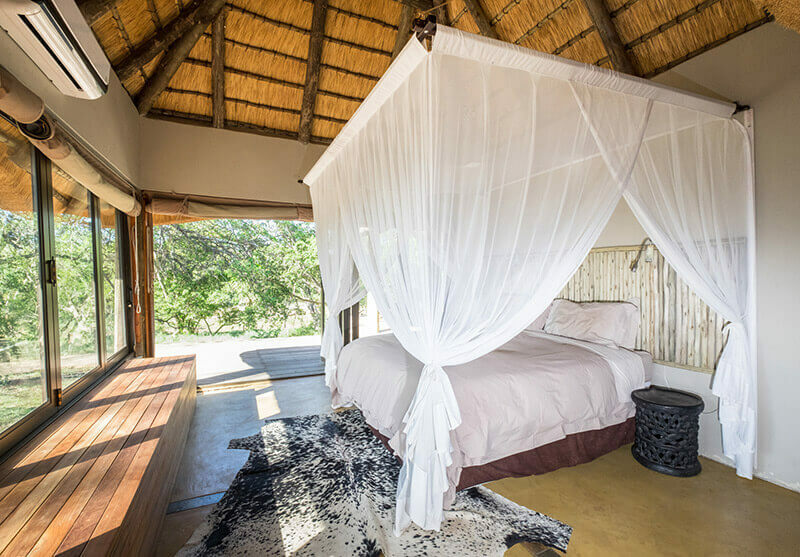 Guests can choose from double en-suite luxury rooms, family chalets or one of our two-bedroom private safari homes (the Cottage and the Homestead). The camp accommodates a maximum of 24 people at any time. 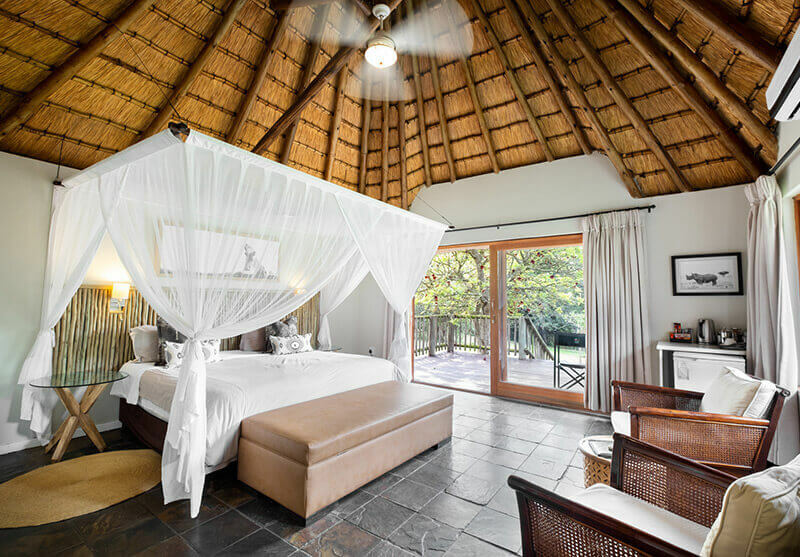 All accommodation types feature air-conditioning, ceiling fans, private verandahs, mosquito nets, coffee and tea making facilities, and a fully-stocked minibar. Our most traditional style of accommodation is our four en-suite luxury rooms. 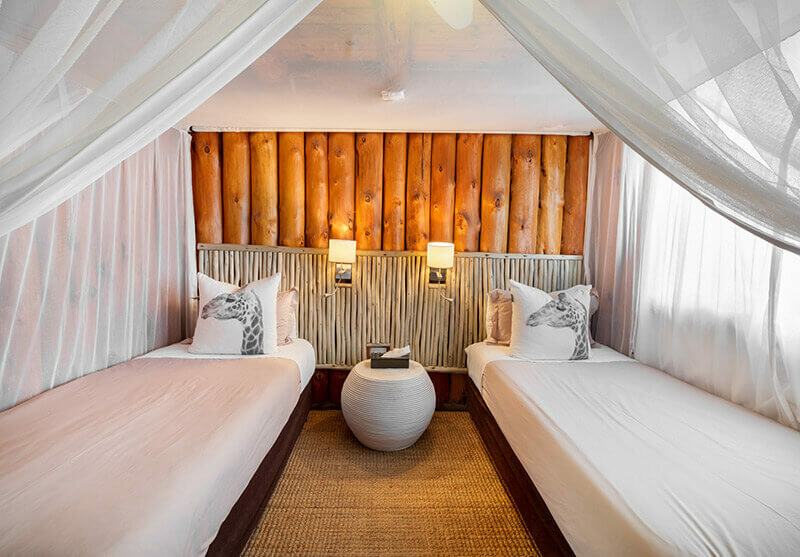 The rooms are decorated in a modern rustic style with newly renovated bathrooms. 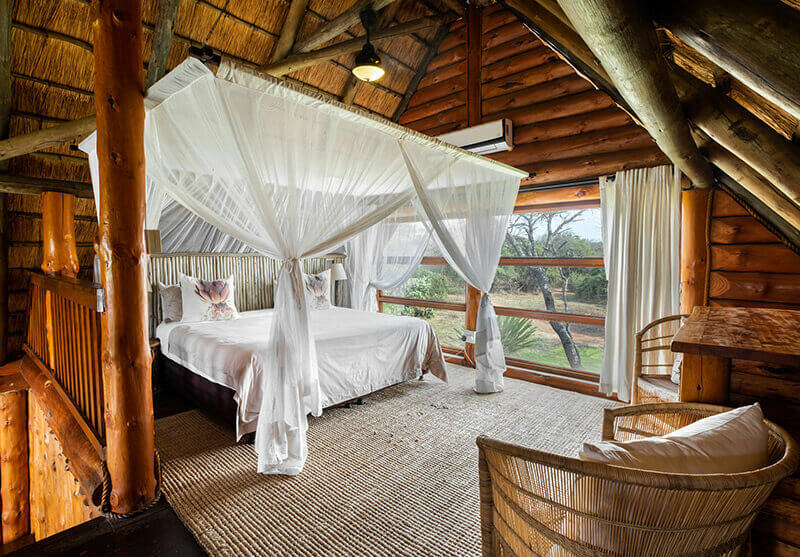 Each room has either one king sized bed or two single beds covered by a large mosquito net, a sitting area, and a private veranda. For small family that would like to share accommodation or groups of friends that would like a little extra space, we can offer our family chalets, which can accommodate up to four people each. 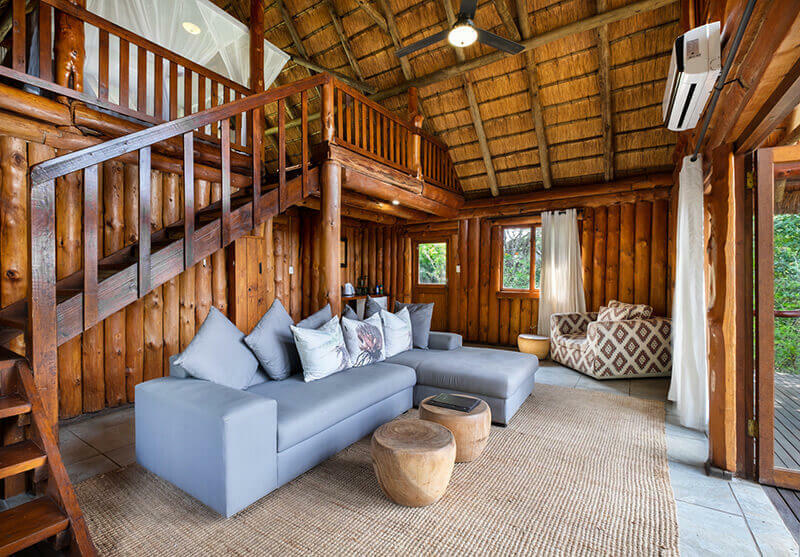 Each log cabin-styled chalet has two double bedrooms (one is a second story loft-style room), a shared bathroom with bathtub, an open plan living area, and a private boma. We have two family chalets available. 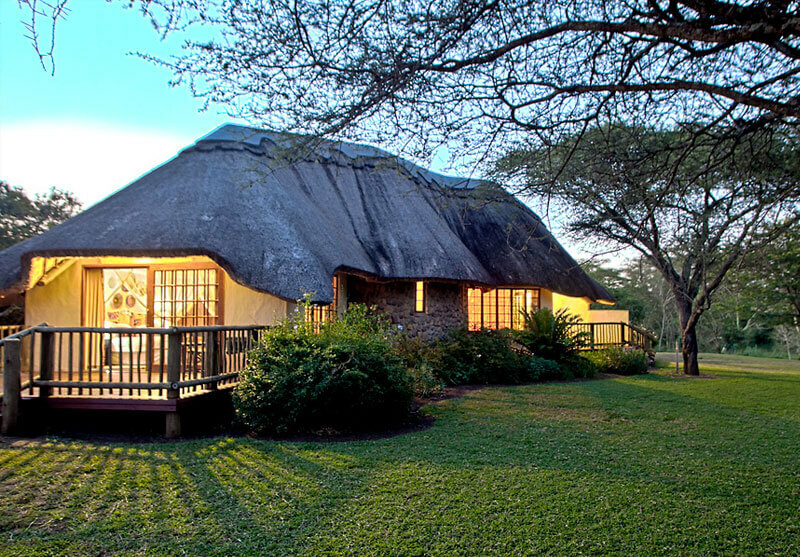 Guests that desire a little extra space and seclusion can book this traditional thatched house. 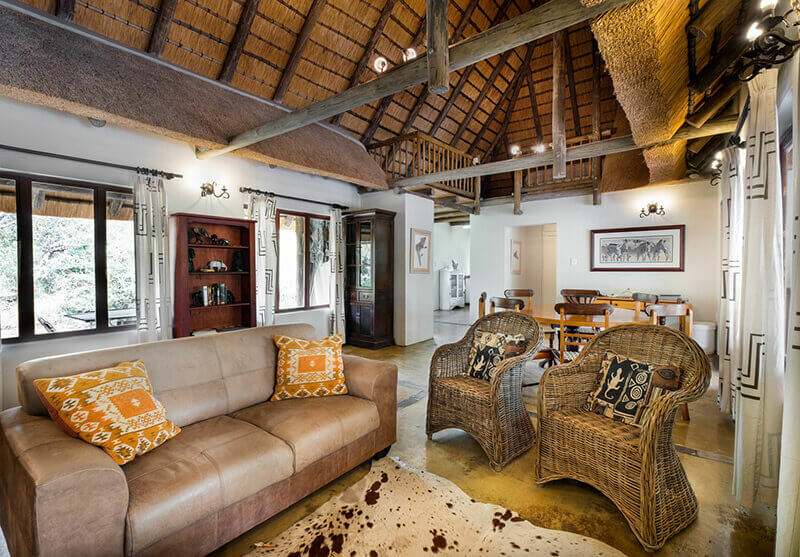 This private safari home is reminiscent of a British cottage with a nod towards African-inspired decor. 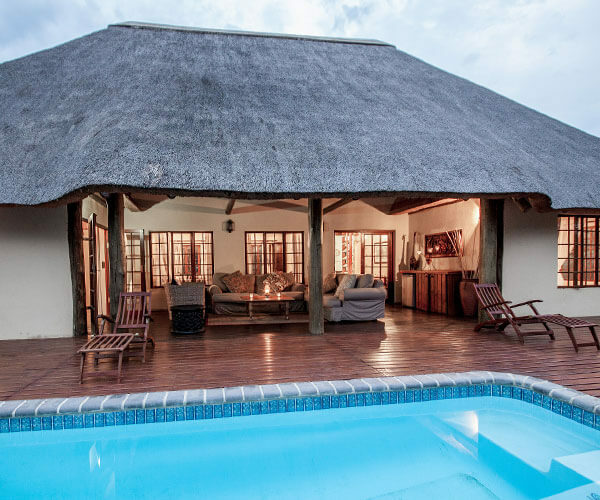 The house can accommodate four guests in two en-suite bedrooms, complete with air conditioners and stunning views. The Cottage features a cozy lounge and dining room as well as a fully functional kitchen. 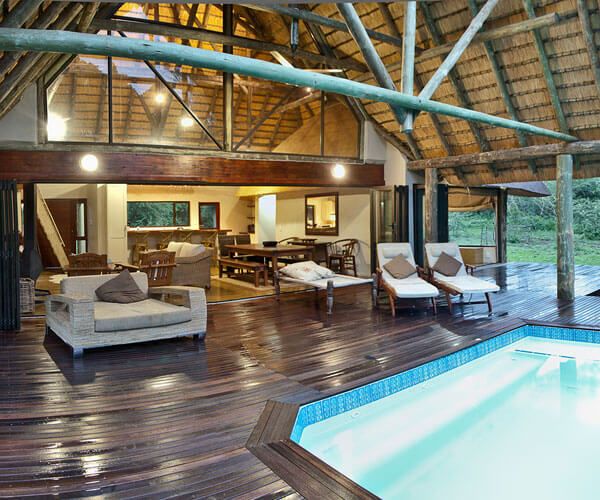 The covered verandah and private swimming pool overlooking the Msunduze River are the star features of this comfortable house-the perfect spot to enjoy family or friends while taking in the sights and sounds of the Zululand bush. 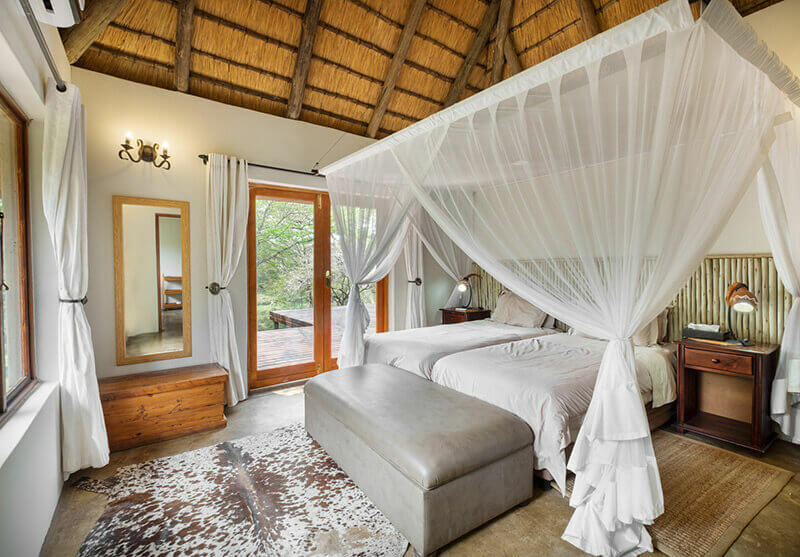 The ultimate option to stay in privacy and luxury is Rhino River Lodge's exclusive Homestead. 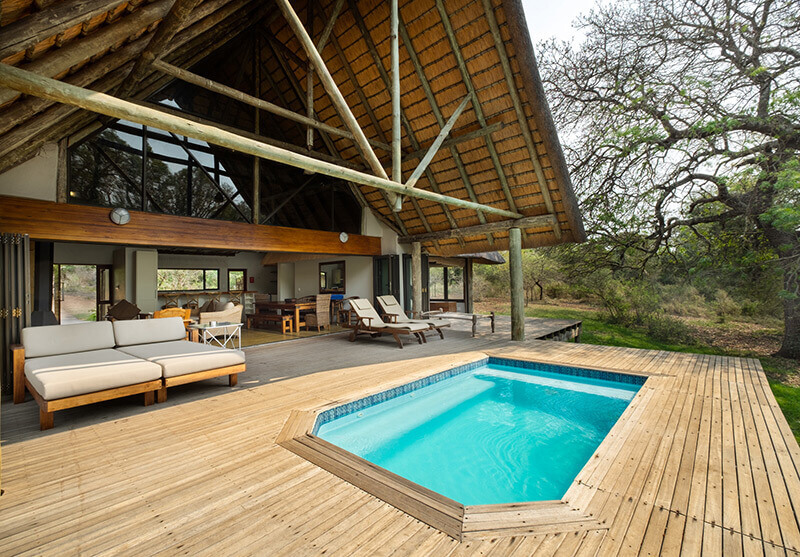 This stylish contemporary two-bedroom safari home can accommodate up to four guests. 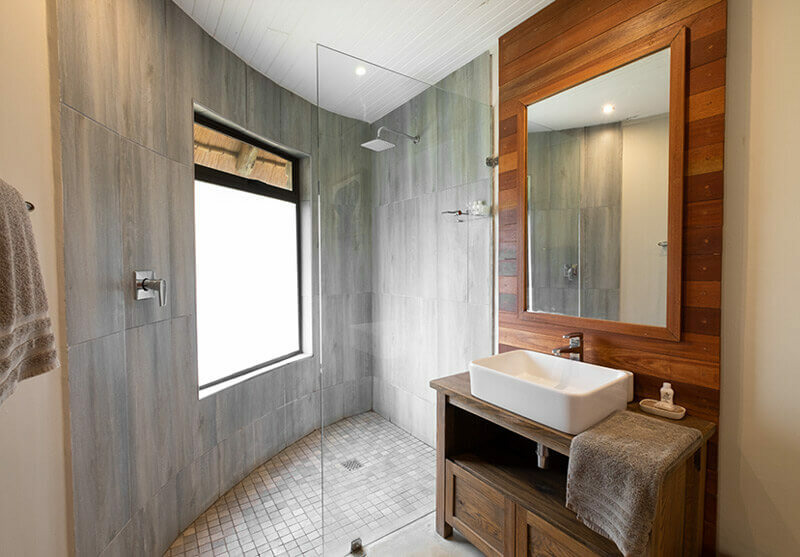 Each bedroom has an en-suite bathroom with bathtub and features an outdoor shower. 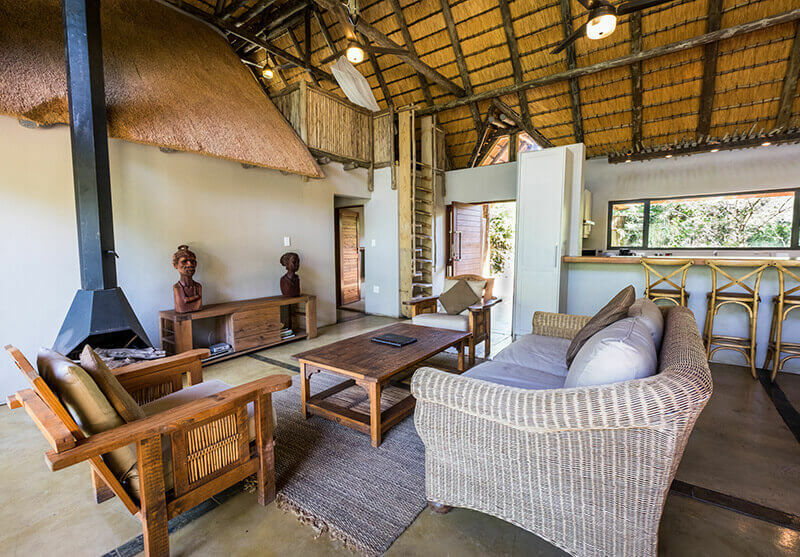 Stacking doors in the spacious lounge fully open onto a private deck at the edge of the camp‘s boundary with un-touched bushveld views. This modern-styled home was designed to highlight the natural surroundings. 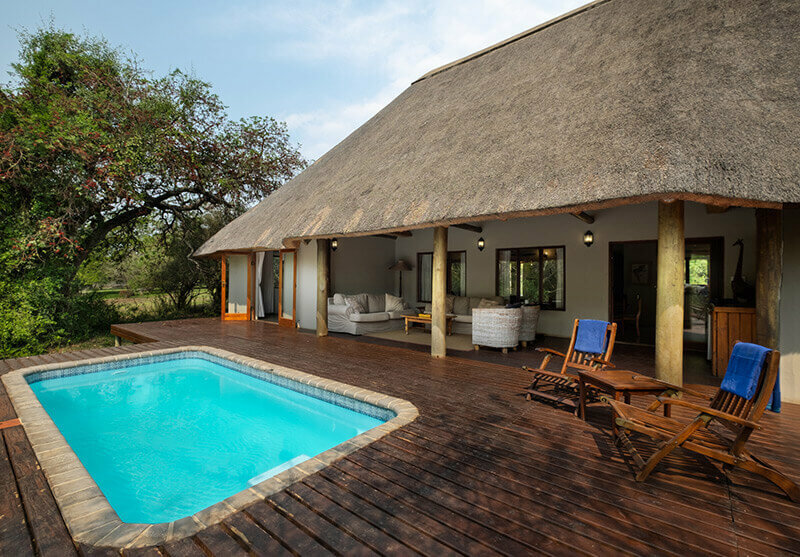 The Homestead is equipped with a fully functional open plan kitchen, air conditioning, and a private plunge pool overlooking the Msunduze River bed.